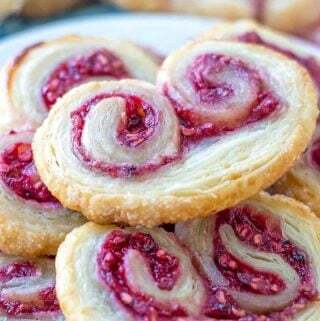 Delicious, easy and fun these Raspberry Palmiers are made with puff pasty, fresh raspberries and sugar and baked up until golden. Sprinkle half of you sugar on a clean work surface then place puff pastry on top of sugar. Gently roll your puff pastry out slightly, but not too much to get sugar pressed into dough. Sprinkle remaining sugar on top of dough and gently press down with rolling pin. In a bowl add your raspberries and sugar and mash with a fork or pastry blender. Sprinkle in cornstarch and stir around. Spread raspberry puree onto your puff pastry. Roll up on long sides to center with both sides of pastry so they meet in the middle. Wrap in plastic wrap and place in refrigerator for 30 minutes. Once pasty is chilled remove from refrigerator, unwrap and slice into 1/4" pieces and place on prepared baking sheet a couple inches apart. You will want to do these in batches since there will be too many for one pan. Bake for about 12-15 minutes until golden and puffy.